This guidance establishes uniform standards for the safe movement of marching and running formations on public roadways. This will cover all aspects concerning marching with groups, hereafter known as ‘Marching Group Formations’ or MGFs. An appropriately qualified fitness professional should be in charge of the MGF. 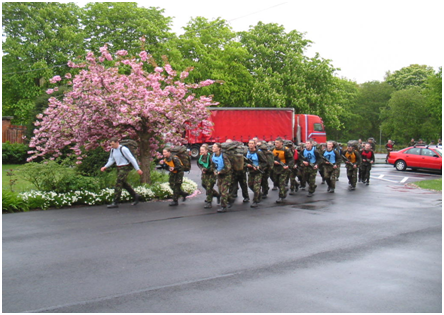 MGFs will march/run to the left of the centre line, including individuals in charge of the formation. Where appropriate make use of pavements, although MGFs should not exceed three abreast while on pavements. When using pavements MGFs must give way to pedestrians. Instructors in charge of the MGF should be positioned to the right and rear of each MGF to control direction, pace and to police the rear of the column. The instructor in charge will ensure that safety equipment is used. Markers will wear high visibility vests. For MGFs with more than eight persons, conduct group movement with columns of no more than three files. At a minimum, all individuals in the first and last ranks and one individual at the midpoint of the first and last file of each column in the MGF formation and any personnel to the right of the formation will wear high visibility vests. MGFs of eight persons or less will run in a single file. One individual in charge of the MGF will run to the right of the file and control the direction and pace of the MGF. These small groups will run on the extreme left of the roadway. Each person will wear a high visibility vest. Each MGF will designate one or more instructors to manage a straggler control group (SCG). These instructors will run with high visibility vests and flashlights (as appropriate). As this SCG increases in size, instructors will ensure that they merge into no more than two files. All stragglers will run to the extreme left of the road. When individuals continually fall out of formation and are placed in the SCG, instructors will use this trend to identify those in need of special physical training (PT) and ensure they are placed in the appropriate ability group level. Instructors must be aware of restricted and out of bounds areas, such as those identified in the licensing agreement. Risk management is the overall responsibility of the organisation in charge of the marching event. The instructor in charge is responsible, on the day, for ensuring that a risk assessment is prepared, maintained and on file for the marching event. Instructors will assess (hot and cold) weather conditions to determine risk management for heat and cold injury prevention. All individuals identified as markers will wear high visibility equipment and will also carry flashlights during hours of limited visibility. Instructors will conduct an inclement weather and/or dense fog risk assessment and will either postpone PT or use off-road alternatives when visibility limitations prevent motorists from seeing markers. Detail and brief front and back markers. Ensure that the markers have high visibility vests on. Have full control of the group. Lights if visibility is poor. Consider squad as a vehicle and move accordingly. For further information please view the Clothing & Adverse Conditions section of the website.